Thank you, Yaelian! You're right, these are very Pesach-friendly. Yet another benefit of almond flour! Shabbat shalom! Beautiful pancakes, I've been using a lot of almond meal and flour lately also. I will be trying these. It's a great low carb alternative too! I'll have to look into that almond flour! Love eating pancakes but I need protein in the morning! Would love for you to share these on our Foodie Friends Friday linky party tomorrow on my blog! Come on over! We pin, we share, we promote! Hi Lois, thank you for the invite and I just linked up! Definitely check out almond flour when you have a chance. I love baking with it and certainly appreciate the added nutrition. Have a marvelous weekend! Almond flour is The Best! I have a gluten free scone recipe a friend gave me that makes me drool just thinking about it. 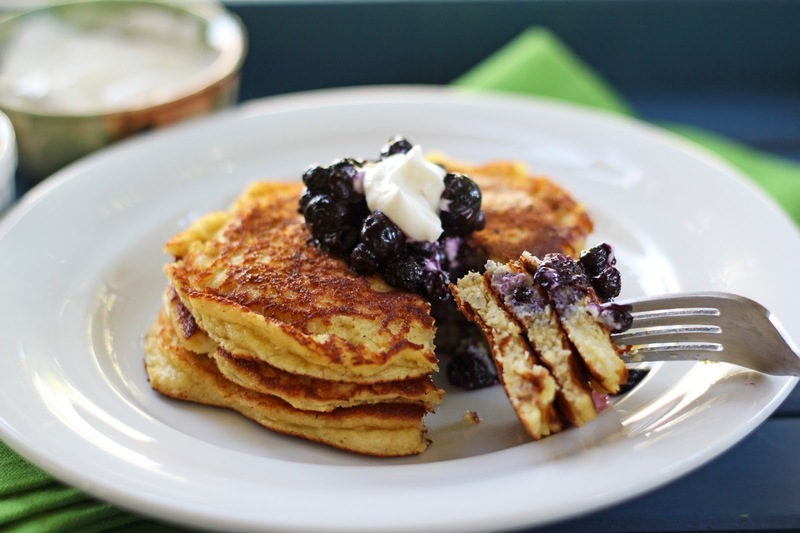 I love the idea of using almond flour in pancakes! And almond flour is terribly easy to make, too to cut the price down a little from some of the store brands! I ground mine in a food chopper/food processor and it worked OK, but I've also seen it done in a coffee grinder. Bigger photos! Yay! Kevin makes pancakes most weekends, and a couple of weeks ago I convinced him to make banana pancakes. 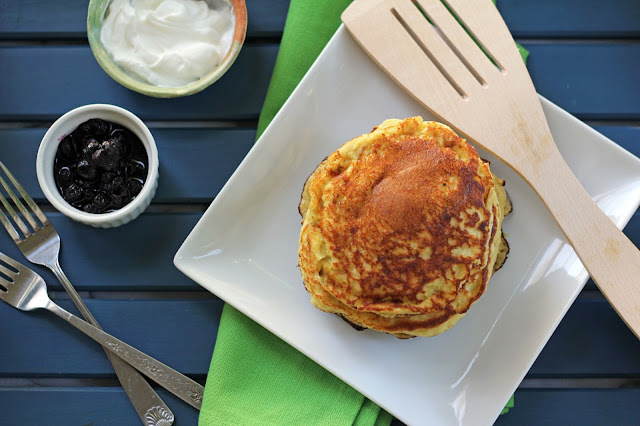 He put banana slices on top of regular ol' pancake batter, and they caramelized up into breakfast bliss! 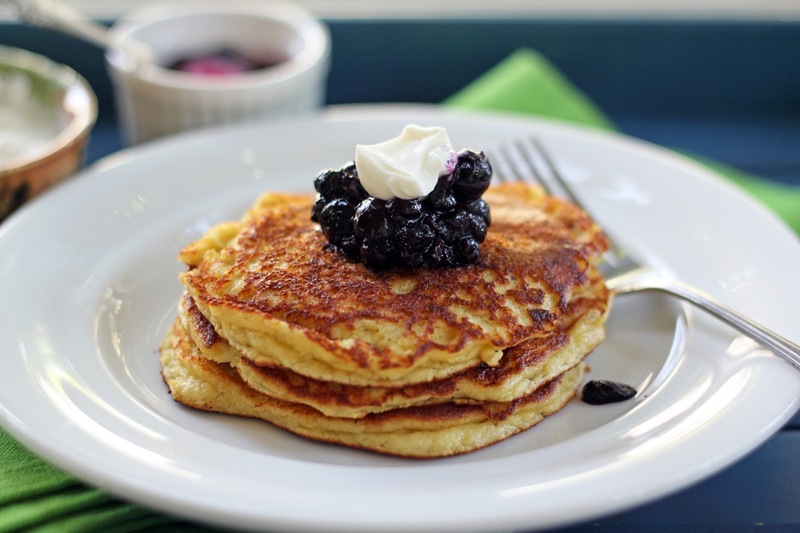 Next time we make banana pancakes I'll have to try them with blueberry compote. Oh, Brianne, caramelized bananas are heavenly - definite bliss. Weekends with pancakes are just the best, aren't they? Hope you and Kevin enjoy a lovely weekend and some delicious pancakes! I am way too hungry to be feasting my eyes on these; I love almond flour so need to try them soon. Lovely photos! The best kind of pancakes are always the ones you make at one in the morning after a long night out. :) (Not that this is a normal occurrence anymore--by which I mean the night out, not the pancakes.) These sound great--I especially love the almond! Thank you, Eileen, and you're so right! Nothing like pancakes to comfort and ease you into the day...no matter now early or late it may be. I hope you have a marvelous weekend! Have a great time in Laguna - such a beautiful place and my favorite southern Calif spot. Wishing you a wonderful weekend ahead! Holy Moly these look good! I adore almond flour but I haven't used it for pancakes yet. My poor youngest gets a new kind of wheat free pancake every weekend. Trying to find that perfect tasting and texture. We'll be trying these Saturday morning. :) Delicious Hannah! Thank you so much, Karista! I'm loving the almond flour and am turning to it to bake with more often now. I do hope your family (especially your daughter) enjoys the pancakes! Have a marvelous weekend! My husband is doing the stupid no wheat thing everyone else is doing...so these could be perfect, I think, right? Absolutely, no wheat here and lots of extra protein. My boys devour them - hope your husband does, too! I'm loving the sun streaming in the window right now...let's hope it sticks around. Happy weekend to you, Erina! I've used almond flour in some of my cookie recipes and now thanks to your recipe I will be making pancakes. They look delicious with the blueberries too. Thanks so much for sharing. My pleasure, Joanne! I hope you enjoy the pancakes. Love that you use almond flour in your cookies! I'm going to be trying almond flour in more of my baking now. I'm happy you stopped by - have a wonderful weekend! Hi Sandra! I'm so sorry to hear this - I can imagine you were disappointed when the pancakes fell apart. Hmm, I use Bob's almond flour, as well, as I find it to be the most finely ground of store-bought almond flours. I keep mine in the fridge, so I don't think the freezer would be too different. The pancakes are rather delicate, so I find I do have to flip carefully. You could definitely use coconut oil in the batter if you prefer. I was making multiple batches of pancakes, and found it quicker to use olive oil rather melting coconut oil (plus I like the flavor). I'm delighted you tried the pancakes and hope you do so again. Please let me know how they turn out! Thank for your feedback. Love these Hannah! Are you using regular Almond Flour or Blanched? Not sure if it even will make a difference but I have been seeing a lot of both lately so just wondering what you prefer. I would happily join you on a pancake search! one of my most favorite things! 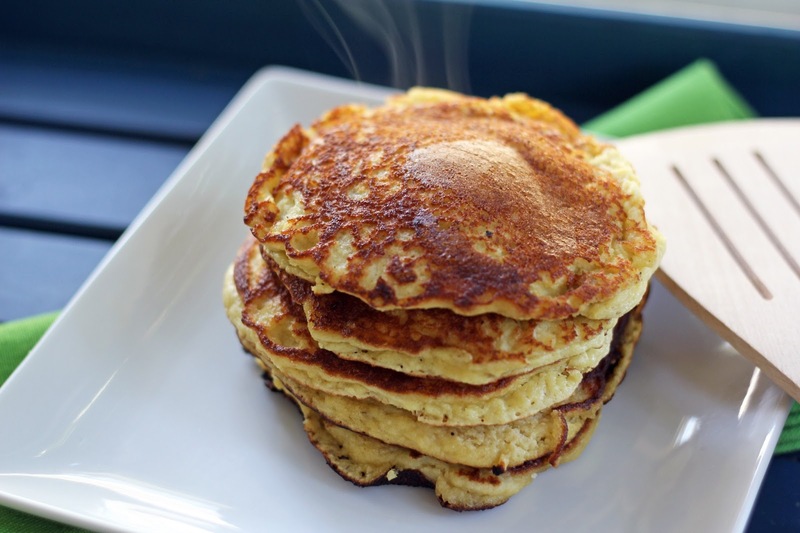 banana pancakes are definitely one of my favorites! A Seattle pancake search would be so much fun, Alex! Do you have any favorites in particular here? Pancakes do make for happy mornings. Hope all is well with you! These sound wonderful. Thanks for sharing on Foodie Friends Friday last week and I hope you will join us again this week. Hannah! I LOOOOOOOOOOVE bigger photos. Why didn't you do it sooner! :D I can see very well now. My goodness I'm drooling over your pancakes at midnight! Looks so good (still drooling...)! breakfast for dinner! I love pancakes, oh these are yum! Thank you, Orly! I do love breakfast for dinner...my mom often baked puffed German pancakes (I think they're also called Dutch babies) as a dinner treat when I was growing up. I may to pull that recipe out soon! These look fantastic--bookmarking! Pancakes are easy favorites at my house. I could go for some right now. Thanks, Lauren! I could easily eat pancakes everyday! I do hope you enjoy these. Happy almost-spring to you! Hey! This was my first time making pancakes and they turned out pretty good. One thing I would change is the heat and timing though. I had the pan at medium (5 on the electric stove) and 2 minutes in they were on the verge of getting burnt. Turned it down to low-medium (about 3) and the last batch I made turned out beautifully. I also had to scoop 1/8 cups instead of 1/4 to avoid messing them up as I flipped them, but that's probably just due to lack of flipping skills on my part :) Great recipe, thanks! Hi, I'm delighted you made pancakes and thrilled you used this recipe! Weekends are meant for pancakes, I think. I'm glad you tweaked the heat on your stove when making them - stoves vary so much, especially gas vs electric, so quite often the timing and temperature have to be adjusted. I appreciate you letting me know and am happy you stopped by. Happy flipping! Hannah, I am just starting the grain free journey. I am eating a stack of your pancakes as I type :>) I find scrambled eggs upset my stomach first thing in the morning. These pancakes are a great alternative. I am finding that baked goods with almond flour are grainier, but it's a trade off. My pancakes are yummy! They are delicate. Use a big spatula for turning and let them cook really well before turning. Thank you!!!! Good morning, Marsha! I'm delighted you made these pancakes and that you're enjoying them. Thank you for letting me know! 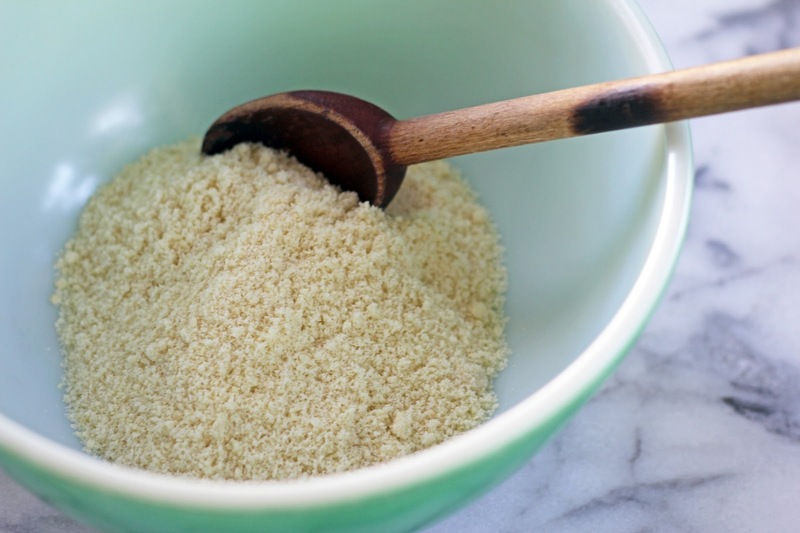 Almond flour can definitely be grainy. I've been using Bob's Red Mill finely ground, blanched variety which I find to be better in baked goods. Honeyville is another brand that has been recommended but I haven't tried it yet. I wish you well on your grain free journey! These look fantastic! I am hoping to make these for breakfast tomorrow. Question, I am out of bananas - can I still make them? 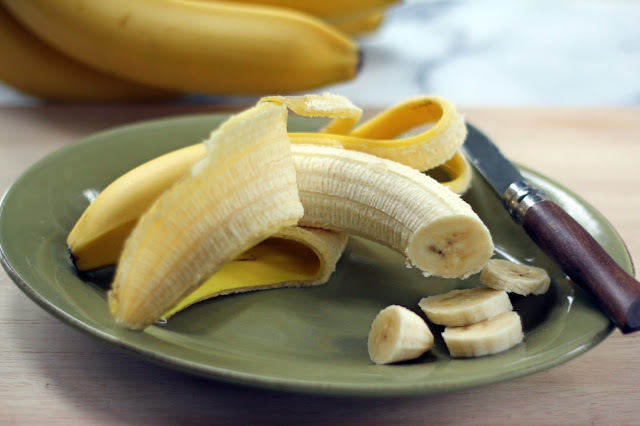 If I leave the banana out will I need more or less of the other ingredients? Thanks so much. Can't wait to try these. Hi Annah, you do really need the banana in these pancakes for the structure as well as flavor. I know you can make plain almond flour pancakes but I'm not sure of the ratio of ingredients. If you decide to make them I hope you enjoy them! I'm happy you stopped by.